From 1 November 2012, all tyres sold within the EU have to be labelled, so you can make a more informed decision as to which are the best for your needs. The labelling system introduced for tyres is much the same as the one that’s been used for white goods for years, so if you’ve been in your local electrical superstore recently, you’ll know what to expect. 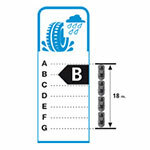 This diagram tells you how a tyre is likely to affect your fuel consumption. Fuel-efficiency is graded from A (most efficient) to G (least efficient). It’s reckoned you could save up to £110 or 80 litres of fuel over the life of the tyres if your car is fitted with four A-rated tyres driving at 50mph – your car will use around 7.5% less fuel than if it was fitted with G-rated tyres. The results will vary with the type of car or climatic conditions, but the performance gaps are proven. This chart tells you how your car’s braking will be affected when the roads are wet. The scale runs from from A (the safest, stopping in the shortest distances) down to G (least safe, with longest braking distances). Fit the best tyres and you should be able to pull up around four car lengths earlier; a car fitted with four A-rated tyres driving at 50 mph will stop up to 18 metres sooner than the same car on G-rated tyres. This diagram shows you a tyre's noise level in decibels (dB) and how they relate to the mandatory EU-wide limits which will be introduced at some point in the future. The levels of tyre noise heard outside your car don’t necessarily relate to what you hear inside the car, but bear in mind that a 3dB increase in noise levels is actually a doubling of the volume. 3 black waves = Noisier tyre. Level greater than the future limit but complies with today's noise regulations. 2 black waves = Average tyre. Noise level equal to or below the future limit by up to 3dB. 1 black wave = Low noise tyre. Noise level 3dB or more below the future noise limit. Tyre longevity: a longer-lasting tyre can cost you less in the long run. The right tyre could give you more than a year of extra driving compared to another tyre. Cornering performance: 25% of accidents are on bends. Dry braking performance: 70% of accidents occur on dry roads.